Discussion in 'Guitars in General' started by shark_bite, Aug 16, 2008. Any quick opinions on this? At $350, it seemed like a steal, but then the only thing I could find after a quick google search for EA-255 was that it's a cheap piece of crap that not collectible and "cheesy" - and that nobody should pay more than $100 or $150 for them. Anyone agree/disagree? Also, the seller says "Gibson never made Casinos" - what?! Gibson made all the Epiphone Casinos, which were re-branded ES-330s. That is an Epiphone Riviera MIJ. They made bolt on models from around 1972-75. The late 70s were set necks with the same frequensator tail piece. The last Japanese run of these in the early 80s had stop tail pieces. All of these MIJ Rivieras had full HBs instead of minis. Of course EA-255 (EA-250) is the model number. These guitars had the serial numbers on stickers - which rarely survived. I've maybe come across 12 or so of these guitars (1971-83 roughly) and only one had an intact sticker - you could just barely read the number. I have a late 70s set neck model. It is a really nice guitar - well built. Pots and switch aren't cheap and work really well. Neck pup was really nice, but the bridge pup was a bit thin and harsh. Replaced with '57s. 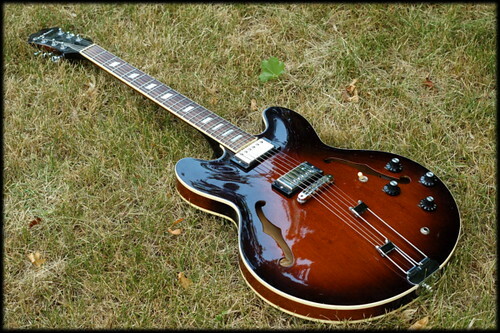 Wonderful axe - very ES335ish. I bought it a guitar shop were there were new Dots, Rivieras and Sheratons. Playability stood out from the Korean models. From what I've read (and I did a fair bit of research on my guitar), the bolt on neck models weren't too bad. As to price? I'm not too up on that, but I don't remember seeing an asking price under $250.00. I've seen an '81 model going for $800.